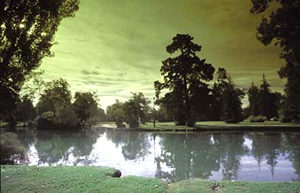 Beaumont Park : In the 19th century, thanks to the English population, the town is composed of sumptuous parks with exotic species from various origins. Also, more than a quantitative impact, this is a qualitative influence on the urban planning which gives its importance to the ”Palois” landscape. The town seems to be built around a fantastic diversity of landscaped figures. The extraordinary growth that Pau had known during the last decades, has not only integrated but also developed this woodland and floral patrimony, by preserving its unique environment.